Videos, solutions, examples, worksheets, games and activities to help Algebra II students learn about arithmetic series. The following diagrams give two formulas to find the Arithmetic Series. Scroll down the page for examples and solutions on how to use the formulas. We can use what we know of arithmetic sequences to understand arithmetic series. An arithmetic series is a series or summation that sums the terms of an arithmetic sequence. There are methods and formulas we can use to find the value of an arithmetic series. Understanding arithmetic series can help to understand geometric series, and both concepts will be used when learning more complex Calculus topics. Determine the partial sum of an arithmetic series. 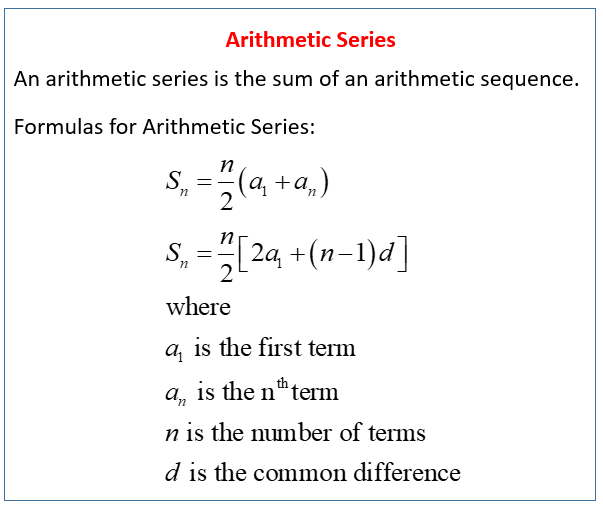 Summing or adding the terms of an arithmetic sequence creates what is called a series. Determine the sum of the arithmetic series. Deriving the formula for the sum of an arithmetic series based on an example. A theater has 50rows of seats. There are 18 seats in the first row, 20 seats in the second, 22 in the third and so on. a) Find the sum of the first 10 terms. b) Find the sum of the series starting with the 11th term and ending with the 28th term. Gives formula for finding the sum of the first "n" terms of a series, and relating the two formulae used. How to find the sum of an arithmetic series?